Strict Quality Control for raw materials and end products. 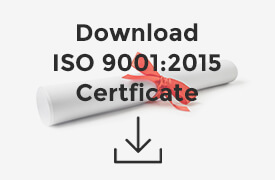 Our manufacturing plant in Esparreguera is ISO 9001 compliant. 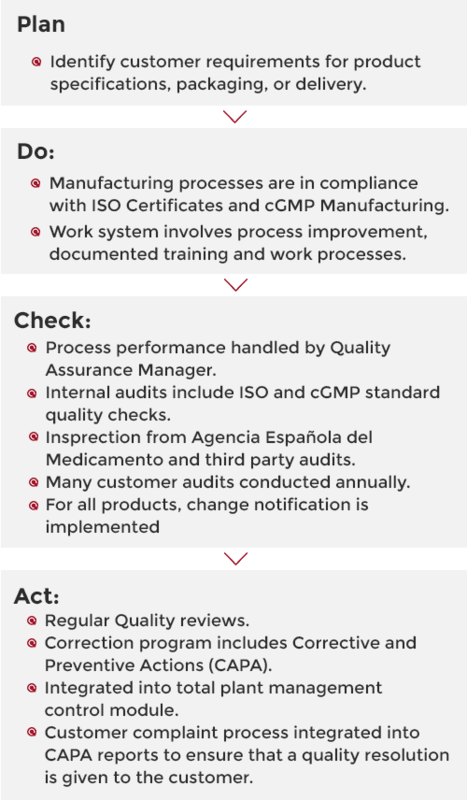 Our manufacturing plant in Venta de Baños is GMP guideline compliant. Certificates of Analysis and Safety Data Sheets available for all our products. Certificates of Origin can also be provided. Our quality system involves specific implementation of quality concepts, standards, methodologies and tools, to achieve our quality-related goals. 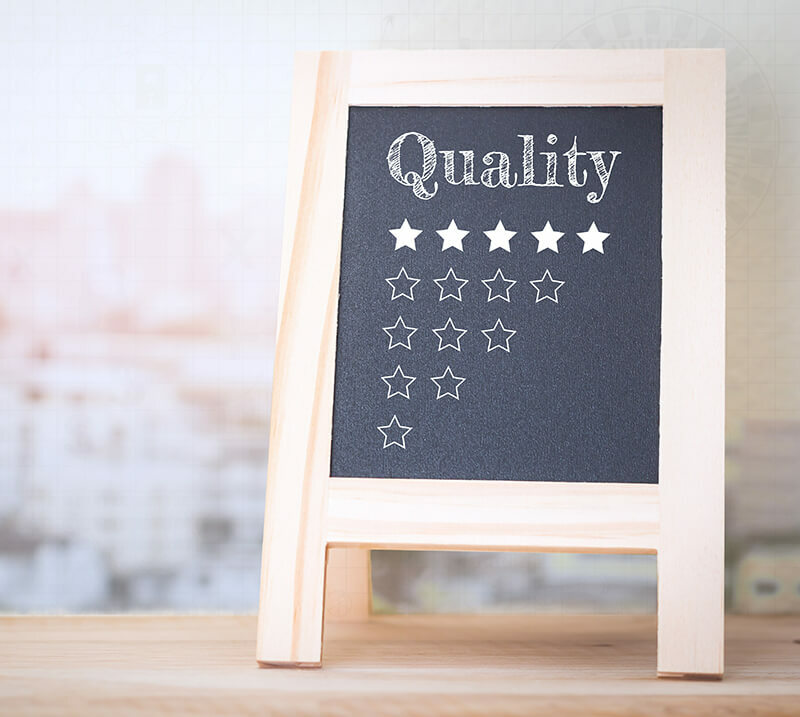 Implementing a Quality Policy is a key management objective and all staff are required to ensure their work adds value to the principles set out in it. We are committed to meeting our customers’ requirements through implementing a management system which includes outstanding quality service and products, safeguarding the environment and assurance of health and safety for personnel. We are a mineral salts manufacturer certified by ISO 9001:2015 and ISO 22000:2005, international standards that specify the requirements we need to follow for a quality management system. Protecting the environment is one of the key factors in the performance of our operations to minimise the quantity, hazard and environmental impact of waste streams generated and avoid unnecessary use of resources. ISO 14001:2015 certification demonstrates continuous improvement and pollution prevention. Quality Chemicals has implemented OHSAS 18001 to provide a safe environment for our employees and visitors. Risk prevention is built into decision-making. All the organisation’s members have occupational health and safety as a priority. We provide our customers with products and services that meet or exceed their needs and expectations. We work with suppliers offering reliable delivery times and product quality to ensure proper service to our customers. Engaged employees are the key to business success. Quality Chemicals is aware of the importance of its team and is passionate about involving its members in the company’s success. Quality Chemicals is committed to ensuring its people feel valued so that they work to their maximum potential and contribute ideas. If motivation increases, results increase. We use a four-stage approach for continually improving our processes, products and services and for resolving problems. This involves testing possible solutions, assessing the results and implementing the ones that are shown to work. Quality Chemicals prioritises the quality of its products. This quality is based on regulatory demands, internal requirements and customer requirements. We invest in our quality assurance team to provide our customers with all the documentation needed so they can trust our quality. These documents cover all production processes and quality requirements. Quality Chemicals is open to being audited by our customers. Our quality assurance team is responsible for planning, preparing, conducting and following up on these audits. We have considerably increased customer audits over the last two years: we perform more than 30 audits per year. Please notify Quality Chemicals six months in advance of the date you would like to audit us. It is very important to know which products need to be audited so as to plan the audit in the right factory. The two factories are quite far from each other, so our team will need to know this in advance to plan accordingly. If the audit is in Venta de Baños, the GMP compliance factory, minimum two days needs to be considered. If the audit is in Esparreguera, one single day would be enough. For all our GMP products we have implemented a change notification system in case there is any major change that might affect the quality of the product or regulations. We know how important it is for our customers to learn if there is any change in the product we supply to evaluate how it affects their processes. The parameters that may be changed are identified by our quality assurance team of experts. Any associated risks are evaluated. All the changes we notify are traceable in a validated system and everything is filed. This system is linked to our Customer Information System (CIS) database and all data are matched with our customers’ contracts and quality agreements. So if for example there is a specification change, our customer will receive an email straightaway. This way we help our customer to stay in control of changing situations and minimise risks associated with changes in manufacturing processes.